Borea Adventures in Isafjordur is moving its offices to Aðalstræti 22 in time for Easter when the town fills with tourists attending the three-day I Never Went South rock festival. 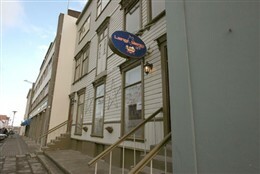 Until recently the premises had been home to the Langi Mangi coffeehouse and pub, which spawned the idea of operating a coffeehouse alongside Borea Adventure´s tour business. Rúnar added that emphasis would be on offering quality, local fresh food.